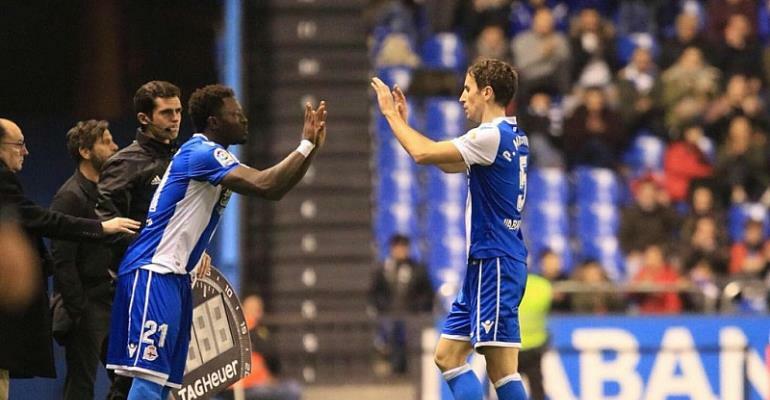 Experienced Ghana midfielder Sulley Muntari made his debut appearance for Spanish side Deportivo La Coruna in the 0-0 stalemate with Espanyol in the La Liga. Sulley came from the bench with ten minutes to end proceedings to replace Spanish international Pedro Mosquera. The former AC Milan midfielder showed glimpses of readiness to help Deportivo La Coruna to escape relegation with some beautiful passes and excellent crosses. Muntari joined The Blue and Whites on Friday and had to wait for only a day to make his debut for the side. Manager of the side Clarence Seedorf who played with Muntari at AC Milan and also coached him in the same club believes the Ghanaian is the right material they need in midfield to fight their relegation battle. The club is currently second from bottom and is hopeful that they could escape the drop.